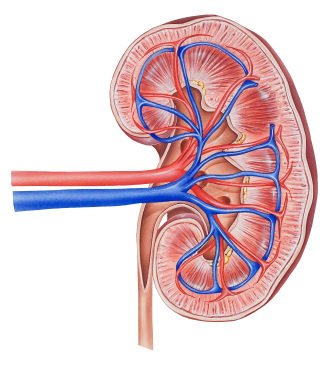 Chronic Kidney Disease – One of the body’s most important organs is the kidney. Properly functioning kidneys are essential for filtering and excreting or saving various chemical metabolites; maintaining proper blood composition and volume; and for helping to maintain proper blood pressure. Chronic kidney disease (CKD) and end-stage renal disease (ESRD) affect more than two out of every 1,000 people in the United States. Diabetes and high blood pressure are the two most common causes and account for most cases. CKD is the slow loss of kidney function over time. In the early stages, there may be no symptoms. The loss of function usually takes months or years to occur. It may be so slow that symptoms do not appear until kidney function is less than one-tenth of normal. The final stage of chronic kidney disease is ESRD. At this point, the kidneys are no longer able to remove enough excess fluids and wastes from the body. The patient needs a kidney transplant or dialysis. There is now convincing evidence that CKD can be detected using simple laboratory tests, and that treatment can prevent or delay complications of decreased kidney function, slow the progression of kidney disease, and reduce the risk of cardiovascular disease. Our goal at Swanson Health Center is to prolong kidney function and prevent it from progressing to ESRD. Metabolic syndrome is defined as a group of medical disorders that increase an individual’s risk of diabetes, heart disease, stroke, and premature death when they occur together. A patient is diagnosed with the syndrome when he or she exhibits three or more of the following characteristics: high blood sugar, high blood pressure, high blood sugar, excess body fat in the waist/abdomen, low good cholesterol, and higher levels of fatty acids (the building blocks of fat). People with metabolic abnormalities are at increased risk of developing kidney disease, according to a study appearing in an upcoming issue of the Clinical Journal of the American Society Nephrology (CJASN). Sankar Navaneethan, MD (Cleveland Clinic) and his colleagues searched the medical literature and combined data from 11 studies examining the relationship between metabolic syndrome and kidney disease. Altogether, they included 30,416 individuals from various ethnic groups. People with metabolic syndrome have a 55% increased risk of developing kidney problems, especially lower kidney function, indicative of kidney disease. Individual components of metabolic syndrome are linked with the development of kidney disease. Kidney disease risk increases as the number of metabolic syndrome components increases. “Primary care physicians may need to consider using metabolic syndrome as a marker to identify patients at higher risk of developing kidney disease,” says Dr. Navaneethan. The data indicates that preventing and managing metabolic syndrome — through exercising, losing excess body weight, eating a healthy diet, and lowering blood pressure and blood sugar levels — may help prevent kidney disease. Higher intakes of omega-3s may slow the loss of kidney function. A three-year study of older adults living in the Sydney area of Australia examined the associations between fish consumption and omega-3 intakes and the odds of developing chronic kidney disease. Overall fish consumption was unrelated to the chance of developing chronic kidney disease, but higher omega-3 intakes from seafood were linked to lower chances of developing the disease. Plant-based omega-3, alpha-linolenic acid, was associated with a greater chance of developing chronic kidney disease. Other polyunsaturates were not related to the chance of developing the condition. In all cases of chronic kidney disease, it’s crucial to avoid malnutrition. A blood test for albumin, a form of protein, is a good way to tell if you are getting enough quality food. Your albumin level should be 4.0 g/dL or higher. If you notice weight loss, loss of appetite or other signs of poor nutrition, talk to your physician. K/DOQI national guidelines for kidney disease suggest a daily protein intake of 0.75 grams per kilogram of body weight for mild to moderate CKD (Stages 1, 2 and 3). Divide your weight in pounds by 2.2 to learn what you would weigh in kilograms. For example, 176 lbs. divided by 2.2 is 80 kg. If this were your weight, you would need 80 x 0.75, or 60 grams of protein per day. In more severe kidney disease (Stages 4 and 5), the guidelines suggest considering 0.6 grams of protein per kilogram each day. Some doctors may advise even lower levels, which require close monitoring. If your diet includes very little protein, your doctor may prescribe supplements of nutrients you would normally get from protein, including ketoacids and/or amino acids. A qualified nutritionist can help with meal plans. What about phosphorous and potassium? Phosphorus is a mineral found mostly in meats and dairy products. It is used by the body to create strong bones and teeth. But starting in the moderate, earlier stages of CKD,the kidneys begin to lose the ability to remove extra phosphorus from the body. If you are also on a lower protein diet, a low phosphorus diet is easier because foods high in protein tend to be high in phosphorus, too. Your doctor may want you to limit dairy servings each day and take a calcium supplement. Taken with meals, calcium supplements act as phosphate binders, because they lock on to extra phosphorus and keep your body from absorbing it. Keeping potassium at the right level all the time is one of the jobs that healthy kidneys do for your body. When kidneys fail, they start to lose this ability. Having the right level of potassium in your body helps all your muscles work smoothly — including your heart. Trans fats. A trans fat is formed when liquid vegetable oils are hardened (“hydrogenated”) to make shortening and margarine. Studies have shown that the trans fat formed by hydrogenation raises levels of bad LDL cholesterol, lowers good HDL cholesterol and raises triglycerides (blood fats)—all known risk factors for cardiovascular disease, which has been linked to kidney damage. Trans fats are commonly found in commercial baked goods such as cookies, pies, muffins and breads, as well as fried foods such as potato chips. 6. New York Times, Oct 30 2008.